For thirsty sea snakes, the ocean can be a desert. 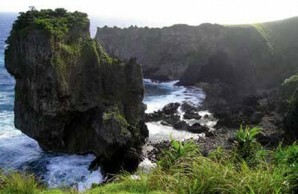 Shore of Orchid Island, Taiwan, where the author studied three sea krait species. 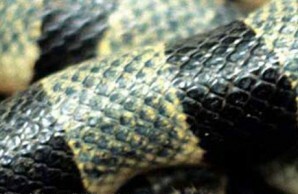 Dimpling of a yellow-lipped sea krait’s scales (detail) is a symptom of dehydration. Sea snakes are widely distributed throughout much of the world’s marine tropics, primarily along coastlines and islands of the Indian and western Pacific oceans. A single species also occurs along the Pacific coast of the Americas between Baja California and Ecuador. In addition to their salt glands, sea snakes have other morphological adaptations to life in the sea. Valvular nostrils prevent the entry of water, and reduced ventral scales let the body compress laterally—which, in conjunction with a paddle-shaped tail, aids swimming. All sea snakes possess a single functional lung. They surface to breathe air, though certain species can also exchange a moderate amount of oxygen and carbon dioxide through the skin. Some species that feed or rest on the seafloor can dive as deep as 350 feet and can remain submerged for more than two hours. Sea snakes have highly toxic venom that most species use to immobilize their prey of fish or eels, and many are important top predators on coral reefs. A few species specialize on fish eggs. Some intriguing clues hinted that sea snakes might need freshwater in their diet. In the 1970s, William A. Dunson, a biologist (now emeritus) at Pennsylvania State University in University Park, had observed the yellow-bellied sea snake, Pelamis platurus, a fully marine species in the subfamily Hydrophiinae, drinking freshwater in the laboratory. 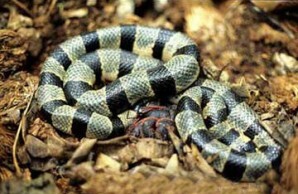 And in 1991, Michael L. Guinea, a biologist at Northern Territory University (now part of Charles Darwin University) in Darwin, Australia, reported observing yellow-lipped sea kraits drinking rainwater in Fiji; they would lick the water from vegetation or gulp it from depressions in coconut leaves. Snakes drinking freshwater in the wild are obviously thirsty, and therefore in negative water balance. Presumably that would not occur if the snakes could indeed get sufficient water from saltwater or from prey, using their salt glands. To determine definitively whether sea snakes require freshwater to remain in water balance, I spent three field seasons, in 2005 through 2007, studying the question in three species of sea kraits that are common at Lanyu, a.k.a. Orchid Island, Taiwan. The three sea krait species represent a spectrum of habits: the yellow-lipped sea krait is semiterrestrial, the banded sea krait (L. semifasciata) is almost fully marine, andthe blue-banded sea krait is intermediate to the other two in its allocation of time between land and sea. I collaborated with Ming-Chung Tu, a biologist at the National Taiwan Normal University in Taipei, and several students assisted us. To begin, we dehydrated sea snakes by keeping them in mesh bags exposed to laboratory air. After two weeks, they were moderately dehydrated—having lost between 10 and 16 percent of their body mass—and therefore thirsty. We then placed each snake individually into an aquarium with seawater and watched to see whether it would drink. We weighed each animal before and after to measure any water it might have ingested. After one hour, none of the snakes had drunk any seawater. Next, we left the snakes in seawater for about twenty hours, overnight. Again we weighed them; none had gained any significant mass. We then placed each snake into a container filled with freshwater and repeated the process. All the snakes drank the freshwater, opening their mouths and sucking it in, and many of them drank copiously within minutes of sensing it. We also investigated whether the sea snakes would dehydrate when kept in seawater without a source of freshwater for drinking. 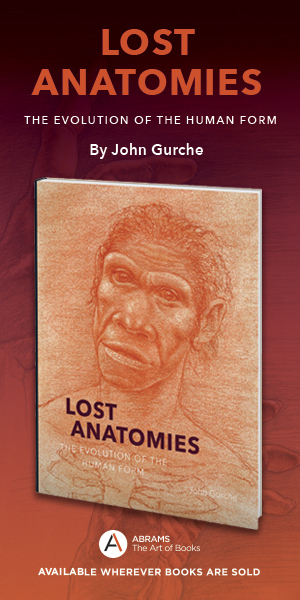 The snakes lost body mass at a constant rate for more than a month, yet did not drink seawater. Other individuals were offered freshwater every third day; they drank variable amounts to rehydrate throughout their time in the seawater. We didn’t feed the snakes during either of the dehydration periods, which simplified the mass measurements. Snakes are intermittent feeders with relatively low metabolic rates, and they can go for several months and possibly longer in the wild without eating. At the conclusion of the experiments, we tested the animals that had no access to freshwater to see what level of brackish water they might drink. We discovered that sea kraits will drink freshwater or very dilute seawater, but not brackish water more concentrated than 30 percent seawater. Our experiments showed conclusively that at least three sea snake species dehydrate in air and in seawater. Moreover, they voluntarily correct for body-water deficits by drinking fresh or dilute brackish water, but refuse seawater. What was true in the laboratory also seems to be true in the wild. We collected sea kraits at Orchid Island that appeared very thin, and they drank large amounts of freshwater in the laboratory. And in the 1970s and 1980s, in Papua New Guinea and in Fiji, I encountered numerous sea kraits with peculiarly dimpled scales. My team and I recently observed that the dimpling is a symptom of dehydration—though I didn’t realize it back then. A quick check of historical weather records for Papua New Guinea and Fiji confirmed my suspicion: I had observed the dimpled sea snakes during seasonal droughts. 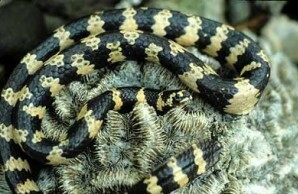 French scientists working in New Caledonia have witnessed numerous yellow-lipped sea kraits emerging from seclusion beneath rocks or vegetation in dramatic synchrony when rain fell after a period of drought. The snakes drank rainwater that dripped or pooled onto rocks. Thus, it seems certain that sea snakes can become severely dehydrated in the wild. 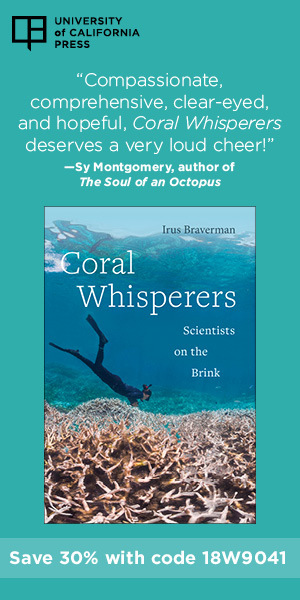 One might expect that a freshwater lens would persist longer after a rainfall in a sheltered location, such as a bay or a lagoon, than on the open ocean. Interestingly, that’s exactly where some notably large sea snake populations have been found. The distribution of sea snakes is characteristically patchy, and we are accumulating evidence that the patchiness might be explained, in part, by the distribution of rainfall both in time and in space. During our field investigations at Orchid Island, we noticed that sea kraits were particularly abundant near a freshwater spring we had discovered while snorkeling near the coastline. Subsequently, we selected eight different coastal sites around the perimeter of the island, and sampled the abundance of the three Laticauda species there, searching at night, when the snakes are most active. Four of the sites have a known source of freshwater nearby. The other four have no apparent source other than rainfall. We confirmed the distinction by testing the salinity of water samples taken at each site. Our sampling showed that the freshwater sites sheltered several to seventy times more sea snakes than did the strictly marine sites, where we often encountered no snakes whatsoever. In 2007, we sampled the two freshwater sites where the snakes had been most plentiful during the past two years. Our visit coincided with a period of local drought, and we noted that they were less abundant than in the previous, wetter years. The drought was so bad that some streambeds were totally dry, including the source of the underwater spring we’d discovered while snorkeling. Some of the villages on the island even ran out of drinking water. When I totaled the local numbers of snakes that we’d counted each visit during three different years, and plotted them against the total precipitation that fell during the six months preceding each visit, there was a positive correlation: more rain meant more sea snakes. On a local geographic scale at Orchid Island, then, the abundance of sea snakes related positively to the availability of freshwater, both spatially and temporally.